The exemptions announced today by the government will not cover most of the people hardest hit by its cruel bedroom tax. 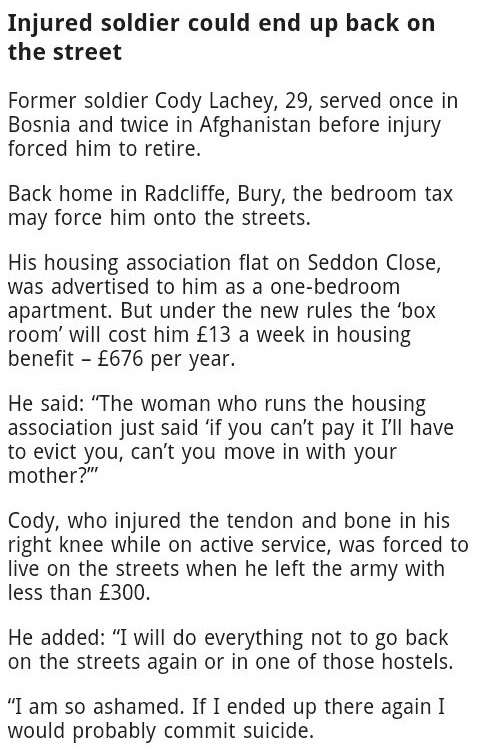 They won’t cover injured ex-military personnel such as Cody Lachey, 29, who served once in Bosnia and twice in Afghanistan before injury forced him to retire and who may be forced to live on the streets by the bedroom tax. It won’t cover people like Janet Bell – who has had a disability lift installed where there used to be a spare room and now has to pay the tax or move. It won’t cover people like Fiona Oxley-Goody – mother of her severely disabled son Logan – who will have to find £60 extra a month or move from their specially adapted home. And it won’t cover couples like Jayson Lowery and his wife Charlotte – who have been told they have to pay £12 a week more or move because Charlotte’s special bed and medical equipment mean they have to use a spare bedroom. The fact is that the bedroom tax will still be affecting over 700,000 people – the majority of whom are disabled. Yes,when a NECESSARY room is deemed “spare” even if terminally ill(a point that has been neglected is that the care of people at home-dialysis etc and facillitation of independent living saves vast amounts of money in other areas)satire is not needed.There for the grace of God(however defined)enters my view-for if living in “social housing”(and it was a close run thing that we remained in own house) we would be subject to asking for discretion to not be charged/have income reduced-the effect is the same-BY ARRANGING OURSELVES IN A MANNER THAT SAVES VAST AMOUNTS TO THE STATE.Misanthropy and false economy driven by ideology,and a fair bit of demonisation. Just had a bit of a heated discussion with some young adults (kids & their friends) about how they cant vote as they have no idea about politics – to them its all “banter” they dont understand, in long words; sputed by Suits who have no idea of the real word & (this bit made me laugh) – THEY ALL LIE!. This is why the Gov are getting away with this tyranny, the disenfranchised youth – They have such a power in their hands & no idea how to harness it, as I believe politics is deliberately kept snooty & full of those with “breeding” to ensure that the majority of the working class electorate feel no connection & hence dont vote. I want to change this – BUT we need a party who will embrace our disafected youth & not broew beat & malign them. We need someone who understands that their screams of “no more bloody foreigners” is not out of racism & “We need our benefits” is not as they are work-shy, but they are without hope of a job as there is none; many act up out of being completely terrified of having to live in the shadows of plush redevelopments, watching the re-juvenation of the areas they have lived in all their lives, as theeir parents sob as they are forced out of homes they have paid for with blood sweat & tears (Yes WE DO WORK). And now we have PR spin on this fowlest of Tax’s – But if you take the time to look – the exemptions are farcical, the whole thing is farcical – There are No smaller properties for a start. I could go on, BUT i’m tired & brow beaten myself & seriously considering just giving up (I have hospital again Monday) & going onto a sickness type benefit for the first time ever…. How can we fight this ?? although I am in agreement that the bedroom tax should go, in the interest of fairness it never applied to those who had mortgages and claimed benefits, I wonder why? Have you read this artcile Tom? It will ultimately help the “couple” you mention and many other cases we hope. The U turn has much more too it than is currently “public”. We need to get as many appeals into the system as possible using the case law that is now not going to be appealed to the Supreme Court.